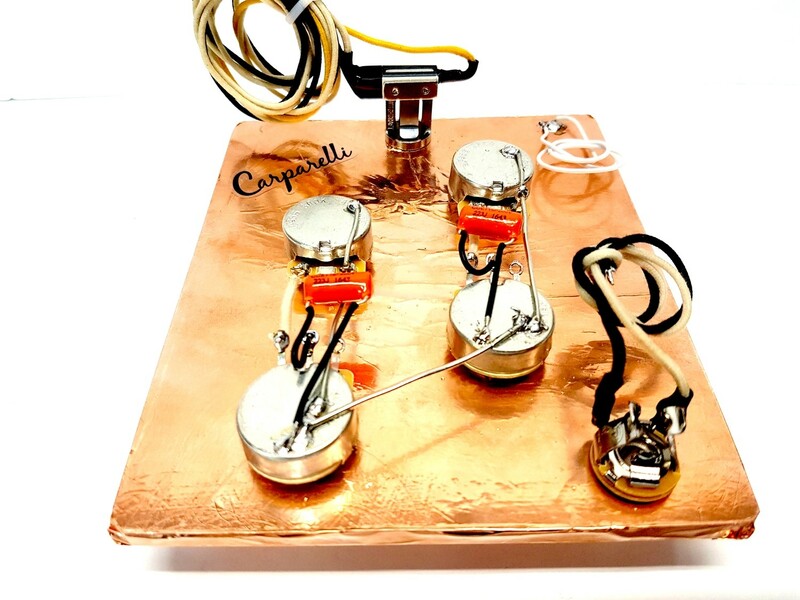 From a Guitar-Tech standpoint we, at Carparelli Guitars, felt the need to create our own homegrown Pre-Wired Kits for the Guitar/Bass World. All the Carparelli Pre-Wired Harnesses are professionally hand soldered right here in our Canadian Shop. Each Kit is templated for a smooth drop-in retrofit. We believe at this point we are the first for using the PURETONE Multi Contact output Jack and for saving you more time and convenience we've also added a 10" AeroSpace grade 22g bridge ground wire. This is our AAA High Grade Kit just a notch under our AAAA Supreme High Grade Kit. Before the kit leaves the door, they are all TESTED and 100% Guaranteed. We will refund you 100% if you are not completely satisfied with your harness kit. that on one day! The Template is great for holding the components correctly and accurately to fit neatly into your guitar wiring cavity. We really want you to have a stress free enjoyable experience so you can start rockin out!